What is Kefir? What Are the Benefits of Kefir? How Do You Make Kefir? The question of “ What is kefir? ” most often leads to “How do you make kefir?” Here are the answers to both. So many times in a discussion of the 10 Healthiest Foods the term “kefir” is mentioned. Eventually, the question arises, What is kefir? This is a valid question since kefir seems to be a food popular only in certain cultures and parts of the world. The health benefits of kefir are not limited. Once the benefits of kefir are explained, the eager health enthusiast follows with another question: Where can I get kefir? This, too, is a good question. Here are the answers to both. The word kefir (other spellings are kefirs, keefir, kephir and kewra to name a few) is properly pronounced as kuh-feer. It is commonly mispronounced as key-fur. No matter how you pronounce it, kefir has a world of wonderful probiotic benefits to enhance your wellness. Kefir is a fermented milk drink that most likely originated in the Caucasus region where shepherds found that milk carried in skin bags fermented into a sour foam. To answer the question, what is kefir, I usually start to explain this wonderful food as very similar to yogurt. Like yogurt, kefir is a fermented dairy product that is ancient in its origin. Both kefir and yogurt have a characteristic sour taste that results from the action of many probiotic bacteria as they work to make milk far more nutritious with their fermenting process. Unlike its more commonly known cousin, yogurt, kefir is not only friendly and important to digestive health as yogurt, but it also employs the fermenting action of beneficial yeasts to transform ordinary milk into a super food that is worthy of being included in the 10 Healthiest Foods. Where Can I Get Kefir? You can get kefir commercially in most any large grocery store or health food store. I will warn you--it is a bit expensive. If you like kefir, it is so easy and inexpensive to make it daily at home. See kefir making for the simple instructions to make it at home for the price of milk. Another difference between yogurt and kefir is that, unlike yogurt that must be heated, kefir is made from unheated milk, thus keeping the original, wonderful raw milk benefits intact. Along with all of the raw milk benefits, kefir is best known for its probiotic benefits. The combination of beneficial bacteria and good yeasts come together for many health and wellness benefits. Kefir has antibiotic, anti-fungal and antioxidant properties. Kefir has also been used in the treatment of many health conditions including metabolic disorders,allergies, cancer, poor digestion, osteoporosis, HIV, heart disease and candidiasis to name a few. The yeasts in kefir will restore balance to the gut flora in the intestine and actually kill the harmful yeasts that cause candidiasis. While commercially produced kefir is a bit expensive, you can make kefir for the price of milk. To make traditional kefir you first have to obtain the kefir grains. Just a short note about kefir grains. These “grains” are not cereal grains nor do they resemble them. Kefir grains are a combination of bacteria and yeasts in a matrix of sugars, lipids and proteins. The grains actually resemble cauliflower. These are living, growing and reproducing organisms that cannot be made in a laboratory. Once you have obtained your original grains, you will grow your own grains indefinitely as you make kefir. 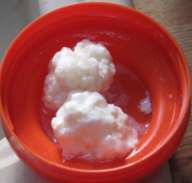 Kefir grains placed in milk kept at room temperature for about 24 hours is the short answer to how to make kefir. Follow the links for more detailed information on kefir making, kefir recipes and suggestions as to where to obtain kefir grains. Benefits of Kefir in a Pill! If you are convinced of all of the health benefits of kefir but do not want to have the daily ritual of making it, then just take a pill! There are probiotic supplements that supply the living and beneficial bacteria. The supplement that I recommend is called Probiotic 12 Plus. Probiotics 12 Plus contains a full spectrum of living, beneficial bacteria. Now you can enjoy all of the health benefits of kefir in a convenient form.